Coal, a naturally occurring combustible solid, is one of the world's most important and abundant energy sources. From its introduction 4,000 years ago as a fuel for heating and cooking, to its nineteenth- and twentieth-century use in generating electricity and as a chemical feedstock , coal, along with oil and natural gas, has remained an important source of energy. The United States alone has 1.7 trillion short tons of identified coal resources (natural deposits) and enough recoverable reserves (coal that can be developed for use) to meet its energy needs until the year 2225. Its demonstrated reserves include 274 billion short tons that existing technology can recover, representing 25 percent of the world's 1.08 trillion short tons of recoverable coal, and 508 billion short tons of coal that existing technology can potentially mine economically. Its recoverable reserves contain more than twice the energy of the Middle East's proven oil reserves. About 100 countries have recoverable reserves; 12 countries—among them Canada, the People's Republic of China, Russia, Poland, Australia, Great Britain, South Africa, Germany, India, Brazil, and Colombia—possess the largest reserves. Figure 1. An example of the structure of coal. of dead vegetation began to accumulate, becoming tightly packed and compressed, and gave rise to different kinds of coal, each with a different carbon concentration: anthracite, bituminous coal, subbituminous coal, and lignite. The English geologist William Hutton (1798–1860) reached this conclusion in 1833 when he found through microscopic examination that all varieties of coal contained plant cells and were of vegetable origin, differing only in the vegetation composing them. Because of its origin in ancient living matter, coal, like oil and gas, is known as a fossil fuel. It occurs in seams or veins in sedimentary rocks; formations vary in thickness, with those in underground mines 0.7–2.4 meters (2.5–8 feet) thick and those in surface mines, as in the western United States, sometimes 30.5 meters (100 feet) thick. Until the twentieth century chemists knew very little about the composition and molecular structure of the different kinds of coal, and as late as the 1920s they still believed that coal consisted of carbon mixed with hydrogen-containing impurities. Their two methods of analyzing or separating coal into its components, destructive distillation (heating out of contact with air) and solvent extraction (reacting with different organic solvents such as tetralin), showed only that coal contained significant carbon, and smaller percentages of the elements hydrogen, oxygen, nitrogen, and sulfur. Inorganic compounds such as aluminum and silicon oxides constitute the ash. Distillation produced tar, water, and gases. Hydrogen was the chief component of the gases liberated, although ammonia, carbon monoxide and dioxide gases, benzene and other hydrocarbon vapors were present. (The composition of a bituminous coal by percentage is roughly: carbon [C], 75–90; hydrogen [H], 4.5–5.5; nitrogen [N], 1–1.5; sulfur [S], 1–2; oxygen[O], 5–20; ash, 2–10; and moisture, 1–10.) Beginning in 1910, research teams under the direction of Richard Wheeler at the Imperial College of Science and Technology in London, Friedrich Bergius (1884–1949) in Mannheim, and Franz Fischer (1877–1938) in Mülheim made important contributions that indicated the presence of benzenoid (benzenelike) compounds in coal. But confirmation of coal's benzenoid structure came only in 1925, as a result of the coal extraction and oxidation studies of William Bone (1890–1938) and his research team at Imperial College. 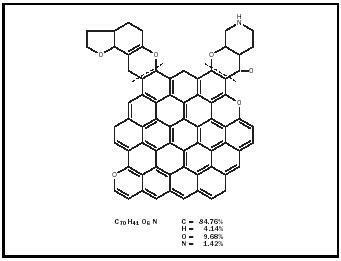 The benzene tri-, tetra-, and other higher carboxylic acids they obtained as oxidation products indicated a preponderance of aromatic structures with three-, four-, and five-fused benzene rings, and other structures with a single benzene ring. The simplest structures consisted of eight or ten carbon atoms, the fused-ring structures contained fifteen or twenty carbon atoms. European and American researchers in the nineteenth and early twentieth centuries proposed several coal classification systems. The earliest, published in Paris in 1837 by Henri-Victor Regnault (1810–1878), classifies types of coal according to their proximate analysis (determination of component substances, by percentage), that is, by their percentages of moisture, combustible matter, fixed carbon, and ash. It is still favored, in modified form, by many American coal scientists. Another widely adopted system, introduced in 1919 by the British scientist Marie Stopes (1880–1958), classifies types of coal according to their macroscopic constituents: clarain (ordinary bright coal), vitrain (glossy black coal), durain (dull rough coal), and fusain, also called mineral charcoal (soft powdery coal). Still another system is based on ultimate analysis (determination of component chemical elements, by percentage), classifying types of coal according to their percentages of fixed carbon, hydrogen, oxygen, and nitrogen, exclusive of dry ash and sulfur. (Regnault had also introduced ultimate analysis in his 1837 paper.) The British coal scientist Clarence A. Seyler developed this system in 1899–1900 and greatly expanded it to include large numbers of British and European coals. Finally, in 1929, with no universal classification system, a group of sixty American and Canadian coal scientists working under guidelines established by the American Standards Association (ASA) and the American Society for Testing Materials (ASTM) developed a classification that became the standard in 1936. It has remained unrevised since 1938. Coal is one of the world's most abundant sources of energy. percent fixed-carbon content and a heating value of 8,300–13,000 Btu/lb (8.8–13.7 million joules/lb). 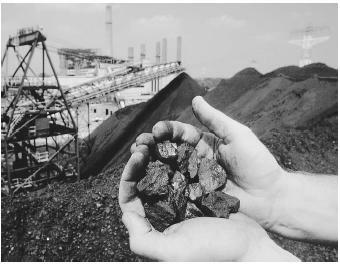 The fourth class, lignite, a soft brownish-black coal, also has a 46–60 percent fixed-carbon content, but the lowest heating value, 5,500–8,300 Btu/lb (5.8–8.8 million joules/lb). Electrical generation is the main use of both classes. In addition to producing heat and generating electricity, coal is an important source of raw materials for manufacturing. Its destructive distillation (carbonization) produces hydrocarbon gases and coal tar, from which chemists have synthesized drugs, dyes, plastics, solvents, and numerous other organic chemicals. High pressure coal hydrogenation or liquefaction and the indirect liquefaction of coal using Fischer–Tropsch syntheses are also potential sources of clean-burning liquid fuels and lubricants. The major disadvantage of using coal as a fuel or raw material is its potential to pollute the environment in both production and consumption. This is the reason why many coal-producing countries, such as the United States, have long had laws that regulate coal mining and set minimum standards for both surface and underground mining. Coal production requires mining in either surface (strip) or underground mines. Surface mining leaves pits upon coal removal, and to prevent soil erosion and an unsightly environment, operators must reclaim the land, that is, fill in the pits and replant the soil. Acid mine water is the environmental problem associated with underground mining. Water that seeps into the mines, sometimes flooding them, and atmospheric oxygen react with pyrite (iron sulfide) in the coal, producing acid mine water. When pumped out of the mine and into nearby rivers, streams, or lakes, the mine water acidifies them. Neutralizing the mine water with lime and allowing it to settle, thus reducing the presence of iron pyrite before its release, controls the acid drainage. Coal combustion emits sulfur dioxide and nitrogen oxides, both of which cause acid rain . Several methods will remove or reduce the amount of sulfur present in many coals or prevent its release into the atmosphere. Washing the coal before combustion removes pyritic sulfur (sulfur combined with iron or other elements). Burning the coal in an advanced-design burner known as a fluidized bed combustor, in which limestone added to coal combines with sulfur in the combustion process, prevents sulfur dioxide from forming. Scrubbing the smoke released in the combustion removes the sulfur dioxide before it passes into the atmosphere. In a scrubber, spraying limestone and water into the smoke enables the limestone to absorb sulfur dioxide and remove it in the form of a wet sludge. Improved clean coal technologies inject dry limestone into the pipes leading from the plant's boiler and remove sulfur dioxide as a dry powder (CaSO 3 ) rather than a wet sludge. Scrubbing does not remove nitrogen oxides, but coal washing and fluidized bed combustors that operate at a lower temperature than older plant boilers reduce the amount of nitrogen oxides produced and hence the amount emitted. Clean coal technologies and coal-to-liquid conversion processes have led to cleaner burning coals and synthetic liquid fuels, but acid rain remains a serious problem despite society's recognition of its damaging effects since 1852. Global warming resulting from the emission of the greenhouse gases, carbon dioxide, methane, and chlorofluorocarbons , is another coal combustion problem that industry and government have largely ignored since 1896, but it can no longer be avoided without serious long-term consequences. Coal remains the world's most abundant fossil fuel, and along with petroleum and natural gas, it will continue to provide most of the world's energy. But all three are finite resources, and society should consume them wisely, not wastefully, in order to extend their lifetimes and reduce their harmful emissions. The conservation of fossil fuels and the development of alternative energies, such as solar and wind power, are pathways to a global society's cleaner energy future. SEE ALSO Fossil Fuels ; Global Warming ; Steel . Lowry, H. H., ed. (1945). Chemistry of Coal Utilization , Vols. 1 and 2. New York: Wiley. Lowry, H. H., ed. (1963). Chemistry of Coal Utilization , Supplementary Vol. New York: Wiley. Kentucky Coal Council. "Kentucky Coal Education." Available from http://www.coaleducation.org . U.S. Department of Energy, Office of Fossil Energy. "Home Page." Available from http://www3.fossil.energy.gov/ . U.S. Geological Survey, Energy Resources Program. "National Coal Resources Assessment (NCRA)." Available from http://energy.er.usgs.gov/NCRA/ . World Coal Institute. "Home Page." Available from http://www.wci-coal.com . Okay, this was very helpful for my research paper, but what i would like to know is if coal can be used in the production of fertilizers,how and what are the applications?. This was a very helpful article but how small can coal get in it's gas form? Like when a factory burn coal for meting metal how small can the gas form of coal get up to?